Meadowlands Hotel in New Jersey is Gateway to NYC 10 miles from Times Square in Manhattan and only minutes from Hoboken, Secaucus and Newark, the Holiday Inn Express Meadowlands Area hotel in the New Jersey borough of Carlstadt offers area travelers and city residents a quiet, convenient respite from the Big Apple. 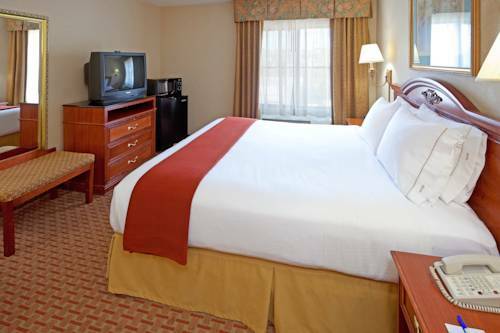 Leisure travelers to our Meadowlands hotel enjoy New Jersey attractions, including American Dream Meadowlands, MetLife Stadium, and Meadowlands Racetrack, all of which are within a couple miles. Shoppers appreciate our hotel's location in Carlstadt, NJ, as well, because we're a quick drive from Garden State Plaza Shopping Mall and Secaucus Outlets, both of which offer the latest New York fashions. Guests can easily venture to NYC attractions like Ellis Island, too, just five miles from our hotel's property. In Carlstadt, NJ, family-fun opportunities abound, especially with Liberty State Park, Time Square and Central Park just minutes away from the hotel. Business guests like that our hotel is near New York City .Along with a great location, our hotel's amenities are sure to please. Enjoy ourindoor pool heated, fitness center, free Wi-Fi access and free parking. Start your day with our Express Start Breakfast. Our hotel's location near New York City is ideal whether you're tending to business in the city or planning a New England vacation. Stay Smart with us! Martini Grill Restaurant: This Martini Grill restaurant offers a car service to and from the hotel. Please ask to front desk to reserve your pick up at the hotel. Allow 20 to 25 minutes. Houlihan's: Restaurant offers the hotel guests 15 percent off the bill. Guest must present their room key to qualify for discount.